Discussion in 'Pregnancy - First Trimester' started by Wobbles, Aug 31, 2006. Share your bump pictures with others as you journey through the First Trimester! That's quite a bump for just over 5 months pregnant. A friend of mine is almost 6 months and she is barely showing, atleast not from the front lol, maybe if she stands to the side she would look huge! cute bum p ya got going on there tho! Wow theres not many in here is there? Ok here's me with Number 2! Me at 5 weeks+3 Days - No sign of a bump! i have nothing to post yet, my cloithes are getting tighter but no bump as yet, i didnt start showing with Coby untill 9 weeks so another couple of weeks and i might have something to post! Aw, look at these little bumps. I've been waiting for you to post yours up Wobbles. 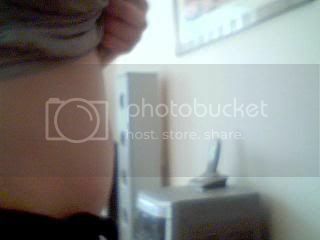 Ya think it's huge now, give yourself another 30 weeks and then see! Hey calling me chubby??? i was in mat gear 8wks bth times!! You can see the deffintion line of a bumb forming ... sooooooo cute! lol be prepared for a 12lber u can def see bump forming!!!! w8 till ur 30 weeks n tryin 2 hold it in thts a laugh n a half!!!! Hell yeah! and you're crashing it into things like doorways and people cos you don't realise how big you are!